Quilting Adventures: A small break from my travels! A small break from my travels! Hubby, who religiously read my blog and offers unsolicited but sometimes constructive opinions ;o), mentioned that I have a tendency to leave my readers hanging. The December 20th, 2008 post needs a closure. If you recall, I blogged about the Yankee Swap gift I was making. This is what I ended up sewing for the swap. I wanted something that would go with every one's decorating style and this was a perfect table topper. We were the only ones that had a hand made gift! It was fun to watch people trade for them! The next post that needs buttoning up is that of December 9th, 2007. On that blog entry I made mention of a machine quilting design I had come up with for the Winter Sentry Quilt. It can take me a bit of time to come up with a design for a quilt. Especially for this one since the blocks were only 4 inches finished. So far I like the way it turned out (if you click on the picture, you'll get a much closer view). It is a little bulky at the center but acceptable! I still have a tad more machine quilting to do on it before I consider this wall hanging complete. The final post that will be buttoned up in the near future is the Crayola affair! I am still working on that one! The objective of the experiment was not only to test the "washability" of the markers but also how long it could safely remain on the fabric. So stay tune for the final post of the Crayola affair coming soon on your computer screen! If there are other post that I have not "button up" please do let me know! Have a great day every one and thank you so much for stopping by! 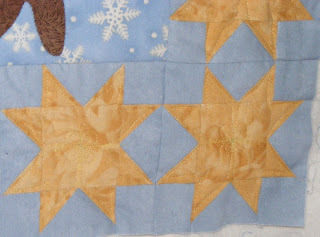 I just love the design you used to quilt the stars in the winter sentry! Great job!!! I didn't feel like you left me hanging. But I do like your follow ups. Maybe hubby shouldn't be reading this huh??? LOL!! A give away -Time for some new friends! Moving along on the quilt front! It's a finish...... Woooo.... hooo.....!!!!! I'm so excited... and I think I like it! The People's Place Quilt Museum - Partie IV ! My Travels - Partie III ! My travels - Partie II !